When it comes to who makes the best movies we automatically think of Hollywood or, if you live in London, Leicester or Birmingham, Bollywood. But, let me tell you about three excellent Scandinavian movies: Force Majeure aka Turist (2014, from Sweden), 22 July (2018, from America/Norway), and The Guilty aka Den skyldige (2018, from Denmark). 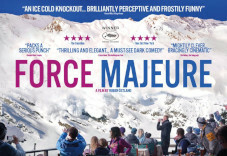 Briefly, Force Majeure tells what happens when a perfect-looking Swedish couple and their two almost-perfect young children take a skiing holiday in the French Alps. Within the first fifteen minutes of the film and after time on the slopes, the family are eating lunch on an outside patio of a mountain restaurant when a controlled avalanche is triggered nearby and a wall of snow appears to be coming straight for them. The wife instinctively gathers the children and prepares to protect them whereas the husband instinctively makes a run for it. As it turns out, the snow stops well short of the restaurant and nobody is injured but, clearly, the wife has noticed her husband’s reaction and the remainder of the film explores what happens to their relationship. It’s a slow burner but the director, Ruben Östlund, slowly but surely ratchets up the tension as the couple come to terms with the husband’s reaction. On the 22 July 2011, a Norwegian right-wing extremist, Anders Breivik, detonated a fertilizer bomb outside a government building in Oslo, killing 8 people. While emergency services were busy sorting out the aftermath of the bomb, Breivik drove 38 km to the small island of Utøya where a Labour Party youth group was gathered for their annual summer camp. Dressed as a Norwegian policeman and armed with a Ruger Mini-14 rifle and Glock 34 pistol, Breivik then proceeded to kill a further 69 people, most of them young people attending the camp. He surrendered without a fight when finally confronted by bona fide police officers. At his trial, he pleaded guilty as charged and was eventually declared sane. He is now serving a long-term incarceration in solitary confinement in a high-security detention centre in Telemark and may never be released. His actions shook the world. Many people questioned how the murders were allowed to happen; how his purchase of fertilizer and ordnance went unnoticed by the Norwegian authorities, and what motivated him to kill so many people. Inevitably, however, his story would become first a book and then a film. 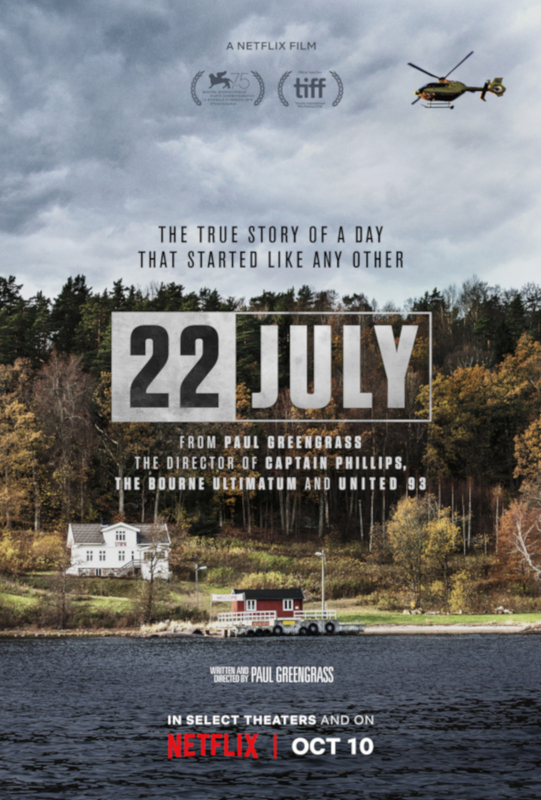 I’ve just watched the film called, quite simply, 22 July, directed by Paul Greengrass (director of several Jason Bourne movies, United 93, Captain Philips…). The story is told from three perspectives: Breivik’s, one of the injured victims, and the reactions of the Norwegian authorities. The massacre scene occurs early in the film and is not over-dramatised nor gory but chilling nevertheless. Anders Danielsen Lie, an actor, musician and medical doctor, plays the difficult part of Anders Breivik with an icy unemotional stare and controlled precise movements. Unlike the Jason Bourne movies, director Greengrass does not dwell on the action side of the movie. He concentrates more on Breivik’s trial and the effect his deeds had on various groups within Norway – those who lost family members, the lawyer appointed to defend Breivik, the politicians and police authorities. Greengrass selected English-speaking Norwegians and the dialogue is in English. The movie caused some controversy in Norway (similar to how the Oscar-nominated movie, Detainment, about the abduction and murder of James Bulger, is currently stirring up objections here in the UK) and many of the outdoor scenes were filmed in Iceland but July 22 is a well-made film and will leave you pondering about what causes terrorism and the effects it has on ordinary people caught up in the attacks. Finally, you may have heard about the 2013 film, Locke, directed by Steven Knight and starring actor Tom Hardy as construction foreman Ivan Locke, the only person seen on the screen for its runtime of 1 hour 25 minutes. The action takes place in Locke’s car and consists of a series of phone calls he makes to various people as he is driving from Birmingham to London. It would seem impossible to make a film starring just one actor but Knight pulls it off with multiple storylines developing as Locke drives along the motorways and Hardy received critical acclaim for his performance, winning the Los Angeles Film Critics Association Award for Best Actor. “The Guilty review – so taut, you almost forget to breathe.” Wendy Ide, The Guardian. I cannot better these short descriptions. Empty your bladder, grab some popcorn and a beverage of choice, and watch the movie. In fact, watch all three movies. I do not think you’ll be disappointed in them.